Gerotor motors, often associated with name brands such as Eaton/Char-Lynn and Danfoss, are a common sight in construction equipment. Well adapted to providing torque in rugged environments, they are compact, reversible, and reasonably priced. In this Shop Talk Blog post, we are going to discuss 5 facts you should know about Gerotor hydraulic motors. The name Gerotor is a combination of two words: GEnerated ROTOR. It was coined by the creator of the Gerotor motor, Myron F. Hill. The term "generated" likely comes from the extensive use of geometric principles required to generate inner and outer rotors that mesh together precisely. Hill wrote a detailed book about the design and motion of Gerotor pumps and motors entitled Kinematics of Gerotors and received patents for the Gerotor design in the 1950s. Of course, math is key to any type of hydraulic motor or pump design, but is especially interesting in the gerotor design. The inner rotor has N teeth, where N > 2. The outer rotor must have N + 1 teeth (one more tooth than the inner rotor) in order for the design to work. The inner and outer rotors are trochoidal and are formed by drawing a series of circles with intersecting arcs -- hence the considerable use of geometry in the design of the rotors. 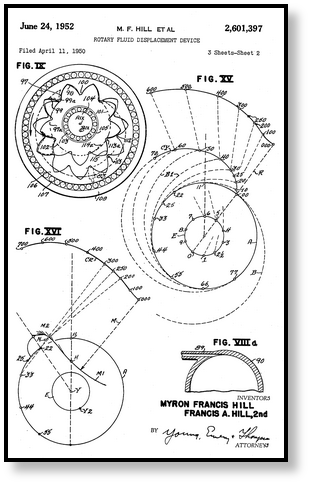 You can see some of the geometry involved in the image shown, taken from one of Hill's patent applications. The Gerotor, also known as a type of orbital motor, has very few moving parts when compared to an axial or radial piston hydraulic motor. Modern gerotor motors are a type of multi-cam lobe hydraulic motor with just two moving parts, as illustrated in the video below. While the actual operation itself may seem simple, however, the design process for creating an efficient, powerful Gerotor motor is quite complex. The elegant simplicity of the Gerotor is made possible by careful design and manufacturing to very close tolerances. Gerotor motors are classified as LSHT, or low-speed high-torque hydraulic motors. That means that, while they run at high speeds, they generate the kind of torque needed for traction-intensive applications in areas such as construction, forestry, and agriculture. Gerotor hydraulic motors are used when there is a need for significant torque. You may have seen Geroler motors. These are very similar to Gerotor motors with one major difference: the Gerolor has rolls added to the outer rotor (outer gear ring) that act as bearings to reduce friction, decrease wear, increase efficiency, and allow for much smoother operation. Both can provide a tremendous amout of torque, but the Geroler motors outperform the Gerotor motors. Gerotor hydraulic motors are an ideal solution for applications that require considerable torque in an unfriendly environment. Most people don't really know where the term Gerotor came from, much less who its inventor was. And while we may appreciate the elegant simplicity of its operation, few of us realize the intense design that goes into producing its geometry so that it is both efficient and powerful. 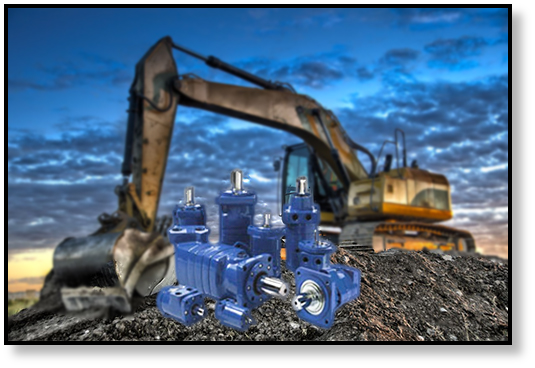 Texas Final Drive and EATON Corporation have teamed up to bring you world-class performance in excavator final drive motors. Check out the free cheat sheet that explains WHY EATON final drive motor IS the next motor you'll be looking for. Summarized specs for the various models in both imperial and metric units.